This tastefully converted ground floor 2 bed detached cottage, formerly the cow barn & dairy is situated on our small holding and surrounded by farmland. It has a relaxed atmosphere and is an ideal base to explore the Island. 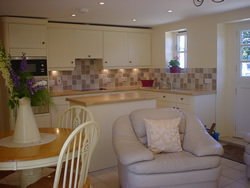 The accommodation consists of an open plan dining/kitchen area including dishwasher, washer/drier, fridge, built in microwave oven and electric oven & hob. The lounge area has TV and DVD with French windows leading onto a large south facing patio. There are two steps up to the bedrooms, one double and one with twin beds. Outside there is a large patio with barbecue, table & chairs & deckchairs where you can sit and enjoy the beautiful countryside all around you. All linen and towels including tea towels are provided (please bring your own beach towels). We want you to enjoy your stay here and will do our best to accommodate any special requests. There are no hidden extras, electricity and oil central heating are included in the price together with an excellent welcome pack. Children welcome but sorry no pets. There is ample parking right outside. Please note this is a no smoking property.